Sarah Rees Brennan is a brilliant, up-and-coming, young adult fantasy author. More than that, she is funny and insightful. In her Demon's Lexicon trilogy, she has breathed life into the young adult fantasy genre, one which has been increasingly taken over by zombies and vampires. While fantastical and supernatural beings are at work in Rees Brennan's novels, you get the feeling that you could actually meet Nick, Alan, Mae or Jamie in real life. 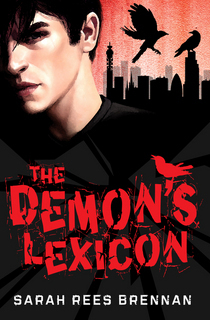 The first novel, The Demon's Lexicon, was released in 2009, and readers were quickly immersed in a story about two brothers who are demon hunters. Haunted by their tragic past, they first meet Mae and Jamie when Jamie's life is threatened by an incubus. Suddenly Nick and Alan's love for each other is being put to the test, and even their past is put into question as they fight for their lives. While the premise initially sounds similar to the TV show Supernatural, which is also about two brothers who hunt demons and cope with their past, the appeal of Nick and Alan isn't in their smoky good looks or witticisms. Nick and Alan aren't meant to be adored or fantasised about; they are deeply flawed and sometimes troubling characters. They are real. Two sequels, The Demon's Covenant and The Demon's Surrender have been released. For fantasy readers, even adult ones, these books are not to be missed. Funny, exciting, and sometimes even tragic, Sarah Rees Brennan has created a world that really pulls you in. If you want to find out more, Rees Brennan blogs about her writing experiences and about trends in literature. Even if you don't enjoy fantasy, it's worthwhile having a look at her blog as she is truly one of the funniest people around.